Since its establishment in 1965, Variety – The Children’s Charity of BC has raised over $170 million dollars to assist the children of this province. Spread throughout our communities, Variety aims to inspire hope, enrich lives and build a better future for children who have special needs. The scope of Variety’s work is far from narrow and is inclusive of everything from therapy and prescription reimbursements to providing grants for equipment and supporting families in transition that may need to travel for treatment. Additionally, Variety has taken the initiative with a number of capital campaigns, including building BC Children’s Hospital, Canuck Place and the Down Syndrome Research Institute & Foundation Centre. While it’s difficult to sum up the extent of Variety’s work in just a few sentences, it’s quite simple to see how crucial this charity organization is to BC’s communities and its children. 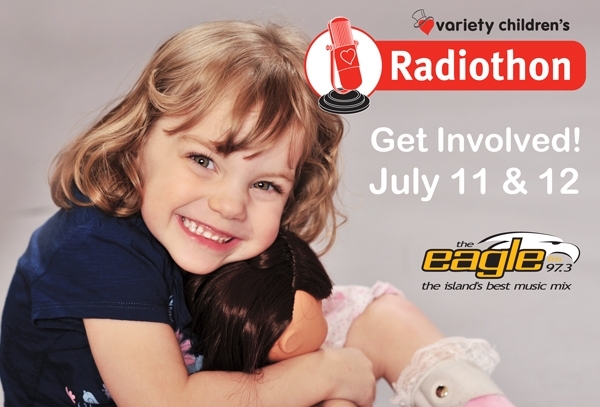 Comox Valley’s The Eagle 97.3 FM radio station is hosting a 2-day radiothon to support Variety and the work it does in the Comox Valley and Campbell River. Proudly sponsored by Telus, the radiothon is a great opportunity for local businesses and families to get involved and help children in our community to get the help they so desperately need. Tune in to The Eagle 97.3 on July 11th and 12th and phone 310-3000 during the marathon to donate. Alternatively, you can also make your donation online. To learn more about Variety, please visit the charity online.